Welcome to an overdue PacificWrecks update! It has been a busy few months since the last update and there is plenty of new news to report. Also, I had the good fortune to be able to travel to New Guinea again due to work and have just returned with plenty of new material I look forward to sharing in future updates. This site is an non-profit, historical Website dedicated to the relics of WWII, and the veterans and stories associated with them. As always, this website grows with the contributions of information and on a donation basis only. I would like to thank all of you who email with information, photographs and news, and the long time & new collaborators that make this site the internet's most comprehensive! By Kevin Delany. Sunk by HMS Tally-Ho off Malacca Strait off Penang, this Japanese Light cruiser was positively identified by divers from the MV Empress, making another major discovery to their already impressive list of ships they have found. Also, Kevin contributes photos from his past finds: De Ruyter and Java. Research and photos by Tim Jordan. The sad legacy of an early war Hudson the crashed in New Zealand due to bad weather, and the wreckage still present to this day. John Douglas' monthly report on wreck related discoveries and happenings in Papua New Guinea , and the longest running column on Pacific Wrecks. Learn about new leads in Dumpu area. Murik Lakes and Port Moresby Gun Batteries. Douglas' self propelled work has resulted in dozens of finds and mysteries left to solve. Two former Papua New Guinea Ki-61 Japanese fighters have arrived at Pacific Fighters Museum at Wangaratta. One, is the famous 'Nuku' Tony that was perfectly intact behind Wewak, and displayed at the PNG Museum until July when it was sent to Australia for restoration. Since the age of seven, Papua New Guinean, Henry Mayer has combed the hills and wartime areas of Port Moresby. His searches and interest in history has revealed an array of objects related to the American and Australian presence in Port Moresby during 1942-45. He has found dozens of buttons, dog tags, badges, insignia, coins, trench art and other objects that tell the story of the war on a micro level. I had the opportunity to meet and interview Mr. Mayer about his most interesting finds. Kevin has traveled to several WWII locations, and shares photos from his trip to Saipan, and of the American Stuart, Japanese Type 97 and H8K Emily wreckage still on the island. He shares photos from his trip and experiences in the Marianas. 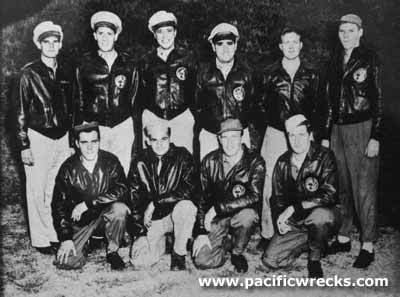 The American military JOINT POW/MIA ACCOUNTING COMMAND (JPAC) has completed several MIA investigations, previously reported on PacificWrecks. JPAC is the new organization for American MIAs, including the former CILHI (Central Identification Laboratory, Hawaii). 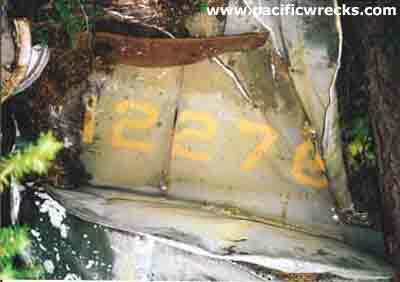 A B-24 near Cape Ward Hunt in New Guinea was the focus of a complete MIA investigation in April 2004 that recovered the remains of the crew. Lost on an armed reconnaissance flight, its crew is finally coming home. 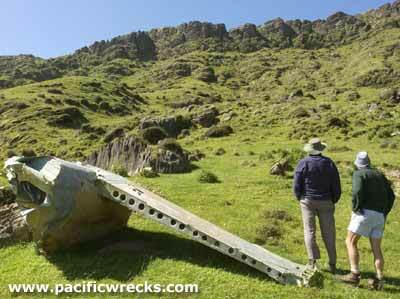 Most recently, a stateside mission to investigate an MIA Navy aircraft, and P-38E Crash Site discovered in 1998 by trekkers Chad Norris and Ben Lynch. Both of these wrecks are wartime losses. We wish the team the best of luck with these important cases, and look forward to more news about their WWII Pacific MIA work. There are more than 78,000 American MIAs from World War II. Several dog tags have been found in the Solomon Islands, are we are seeking the family members, or anyone with information, to allow these tags to be returned. 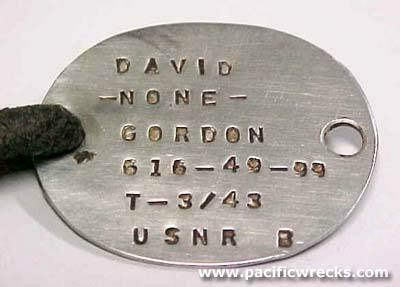 Do you have a Pacific dog tag to return? Contact Us to add it to the page. This is a free service to locate family members or owners and get them back their tags. View all WWII Pacific Book, Magazine and Video Reviews a comprehensive source for all the best Pacific related references and reading. Have a book related to WWII Pacific to recommend? Submit your review of Pacific WWII related books, videos or other publications. anything, new or an old from your bookshelf. All reviews are credited. . This month's update focuses on new DVDs and multimedia releases. This DVD is film taken at Gusap Airfield, in New Guinea in late 1943 / 1944. Presented in high quality digital format, released by RareAviation with a background soundtrack of musical accompaniment. Review by Justin Taylan. Documentation of underwater shipwrecks on V-CDs, CD-Rom and DVD. Pacific Wrecks profiled include sunken ships at Bikini Atoll, including USS Anderson DD-411, and USS Apogon SS-308. Also, new products on the shipwrecks of Truk Lagoon are available too. Excellent unit reference page on Peter Dunn's Australia at War website. Shipwreck photos from the Pacific, Bikini and Truk Thanks to Larry Roth for this link. USAAF unit listings, lineage, assignments, commanders and stations. Thanks for Phil Bradley for this link. Footage of Gusap airbase from Steve Rhode's Rare Aviation website. Thanks to Daniel Leahy for this link. Thanks to Jorma Oster for this link and amazing work of his website. Thanks to Phil Bradley for this link. New Website from J-Aircraft on Japanese ships! Thanks to Chris Jackson for this link. Dive photos from Coron and Bikini. WWII photos from 345th BG from New Guinea, from the 500th BS association. Thanks to Walt Deas for this link. MIA Australian submarine from WWI somewhere near Rabaul. Thanks to Daneil Leahy & John Douglas for these links.